The Language Interpreter Center (LIC) Program Manager will be responsible for learning the overall management duties and day-to-day operation of the Language Interpreter Center. This exciting position will be focused on creating organizational sustainability as well as new program development and involves a high level of administrative management skills. This new position will develop and implement interpreter services after normal business hours for first responders. The LIC Program Manager in conjunction with a call center consultant will set up a telephonic and/or video remote language service program to increase access to the programs services and sustainability. The LIC Program Manager will be supervised by the LIC Program Director. SALARY: DOE with a generous benefits packages. The Alaska Institute for Justice is an Equal Opportunity Employer. Position open until filled. Commitment to equity and justice, and respect for the rights and dignity of others. Integrity, responsibility and accountability in all our work. Pursuit of excellence, in an environment characterized by principles of shared values and team engagement. About the Research and Policy Institute: The Research and Policy Institute includes a small team of people dedicated to social and climate justice research to inform public policy at the local, national and international levels. 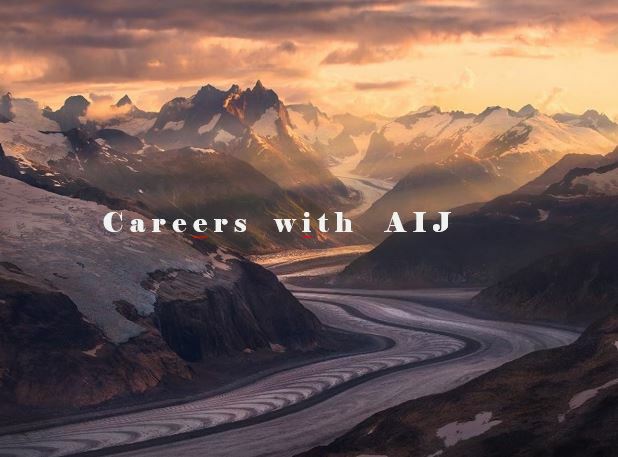 About the Position: The successful candidate plays a critical role in leading AIJ’s effort to forge meaningful, sustainable relationships with Alaska Native communities. The Research and Policy Institute Tribal Liaison Director will be supervised by the Executive Director of the Alaska Institute for Justice and located in AIJ’s Anchorage office. The successful candidate will work with tribal communities across Alaska to improve their capacity to prepare for and respond to climate-related environmental impacts. This involves elevating Alaska Native voices, values, and priorities throughout ongoing community-based environmental monitoring and climate adaptation policy development. This is an excellent role for a person who enjoys meeting new people, planning exciting events, nurturing authentic relationships and meaningful partnerships, is passionate about our work, and can lead innovative opportunities and administrative aspects of the work. Collaborate with the AIJ team to develop and implement strategies to promote AIJ’s Research and Policy priorities among key leaders, coalitions, policymakers and other stakeholders and build relationships with the same. Represent AIJ with state and federal government entities and other local, state, and national organizations to advance AIJ’s Research and Policy Institute priorities. Bachelor’s degree in ethnic studies, environmental studies, social psychology, or a related field that includes coursework and/or experience communicating and working with Alaska Native communities. Strong written and oral communication skills, and ability to build lasting relationships. Strong knowledge of Alaska Native policy, cultures, histories and government relations, including concepts of sovereignty and self-determination. Minimum two years of experience working with Alaska Native communities. Ability to communicate across cultural lines to include interpretation of policy between tribal and federal and Alaska state governments. Self-starter, strong time management skills, must be able to work well independently and as a team member. DOE with a generous benefits package. The Alaska Institute for Justice is an Equal Opportunity Employer.